Peripheral Component Interconnect (PCI) is part of the PCI Local Bus standard. The PCI bus supports the functions found on a processor bus and Devices connected to the PCI bus appear to a bus master to be connected directly to its own bus and are assigned addresses in the processor's address space. Bus mastering refers to the concept that PCI devices can directly access a processors memory bus independent of the processor similar to a Direct Memory Access (DMA) controller. Conventional PCI had 4 shared level-triggered interrupts and uses a paralle bus architecture where the PCI host and all devices share a common set of address, data and control lines. Older generation Gateworks products such as some Laguna product families support the Mini PCI Type III cards. While the original PCI bus, now referred to as 'Conventional PCI' was a parallel bus with shared address/data in 2004 The PCI Express (PCIe) specification was released which defined a serialized version of PCI which is commonplace today. PCI Express is based on a point-to-point topology with separate serial links connecting every device to the host, also known as the root complex (RC). Links may contain from one to 32 lanes (1x, 2x, 4x, 12x, 16x, 32x) with each lane being its own differential pair. PCI Express interrupts are embedded within the serial data. Modern generation Gateworks products such as the Laguna GW2391, Ventana, and Newport product families support Mini PCIe cards. PCI configuration registers can be used to debug various PCI bus issues. The easiest way to access these registers is via the Linux lspci command with the 'very verbose' flag (-vv) which will decode and display the various PCI config space registers. Note that access to some parts of the PCI configuration space is restricted to root permissions on many operating systems - if this is the case you will see certain data flagged as 'access denied'. The various registers define bits that are either set (indicated with a '+') or unset (indicated with a '-'). These bits typically have attributes of 'RW1C' meaning you can read and write them and need to write a '1' to clear them. Because these are status bits, if you wanted to 'count' the occurrences of them you would need to write some software that detected the bits getting set, incremented counters, and cleared them over time. The 'Device Status Register' (DevSta) shows at a high level if there have been correctable errors detected (CorrErr), non-fatal errors detected (UncorrErr), fata errors detected (FataErr), unsupported requests detected (UnsuppReq), if the device requires auxillary power (AuxPwr), and if there are transactions pending (non posted requests that have not been completed). If you want to delve deeper into types of errors see PCI Advanced Error Reporting below. $ sudo lspci -s 1:20:00 -vv | grep -e "UESta\|UEMsk\|UESvrt\|CESta\|CEMsk\|AERCap"
The Uncorrectable Severity controls whether an individual error is reported as a Non-fatal (clear) or Fatal error (set). The Correctable Erro Mask (CEMsk) controls reporting of individual errors by the device to the PCIe root complex. A masked error (bit set) is not reported to the RC. Above shows that Advisory Non-Fatal Errors are being masked - this bit is set by default to enable compatibility with software that does not comprehend Role-Based error reporting. 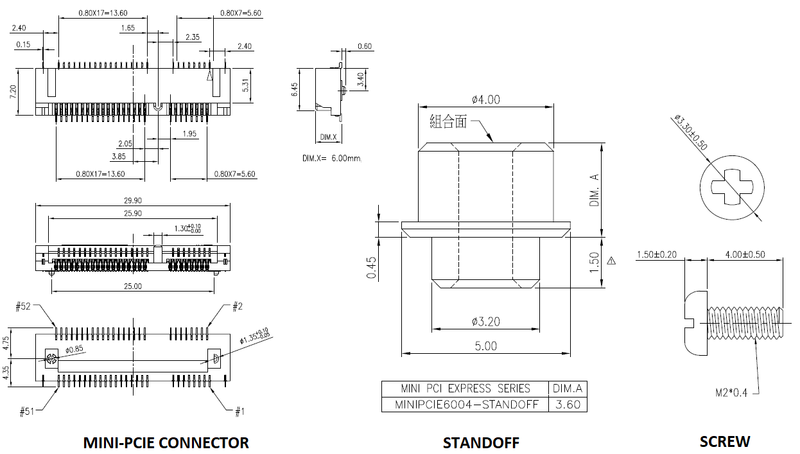 The below mechanical drawing is for the standard Mini-PCIe connector used on standard Ventana/Newport boards. Note that other heights are available as special order (100 piece MOQ). Contact sales for available options. The hold down screws for the Mini-PCIe cards are pre-loaded into the standoffs on the board. If you need additional screws they can be purchased at McMaster? Carr.